At this age, your child will seem to be continually on the go—running, kicking, climbing, jumping. His attention span, which was never particularly long, may now seem even shorter. Try starting a game with him, and he’ll immediately change to a different one. Head in one direction, and he’ll quickly detour to another. This yearlong energy spurt between ages two and three certainly will keep you on the go. But take heart—his activity level will strengthen his body and develop his coordination. In the months ahead, your child’s running will become smoother and more coordinated. He’ll also learn to kick and direct the motion of a ball, walk up and down steps by himself while holding on, and seat himself confidently in a child-size chair. With a little help, he’ll even be able to stand on one leg. Watch your two-year-old walk, and you’ll see how he has cast aside the stiff, spread-legged gait of a young toddler, replacing it with a more adult, heel-to-toe motion. In the process, he has become much more adept at maneuvering his body, capable of walking backward and turning corners that are not too sharp. He also can do other things as he moves, such as using his hands, talking, and looking around. 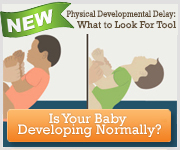 Don’t worry about finding activities that will help your child develop his motor skills. He’ll probably be able to do that himself. When you are able to join in the fun, bear in mind that children this age love piggyback rides, rolling on mats, going down small slides, and climbing (with help) on the floor-level balance beam. The more running and climbing your games involve, the better. If you can, set aside specific times during the day when he can go outside to run, play, and explore. This will help minimize wear and tear on the inside of the house as well as on your nerves. It’s also safer for him to run around in the open than to bump into walls and furniture inside. While outdoors, let him use the yard, playground, or park—whichever is most available and safe for him. But be aware that since his self-control and judgment lag considerably behind his motor skills, you must remain vigilant and keep safety and injury prevention high on your priority list at all times.